Military technology & equipment, aircraft, tank, & submarine engines. Motor vehicles (Mercedes-Benz Division). Daimler also produced barrels for the Mauser rifle. 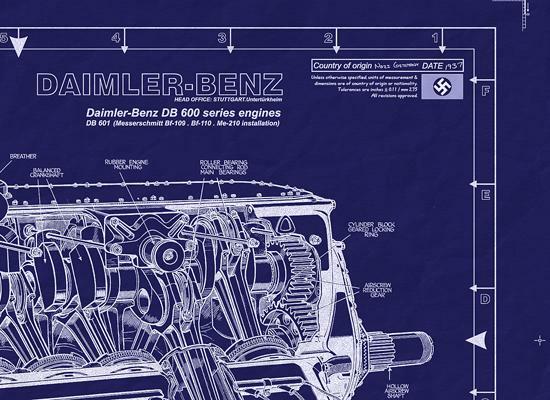 The Daimler-Benz DB-600 series engines, including the DB-603 & DB-605, were all very similar to the original DB-600 inverted V12 engine design. The DB 601 was licence-built in Japan by Aichi as the Atsuta, by Kawasaki as the Ha-40, and in Italy by Alfa Romeo as the R.A.1000 R.C.41-I Monsone. The DB 601 was basically a DB 600 with direct fuel injection. The primary differences between the 605 and 601 were a small re-bore for greater displacement and an even more powerful supercharger. Daimler-Benz DB-601 - Is a liquid-cooled inverted V12, and powered the Messerschmitt Bf 109, among others. Direct fuel-injection gave the Bf-109 a major advantage over the Spitfire when pulling negative Gs.… yes the DB-600 series powered much of the Luftwaffe's lethal fighter force. Continued from above… The famous Daimler-Benz inverted-vee V-12 engines had their start with the DB 600 of 1934. Direct fuel injection was introduced with the DB 601 which gave the Luftwaffe an edge over the RAF during the Battle of Britain...the DB 601 was unaffected by negative g's. By 1944, Daimler-Benz engines were so important to the Luftwaffe that it ran 8 major factories with 6 more being run by other organizations. The late model DB 601 engine is rated at 1,200 hp. for one minute for takeoff and develops this power at an altitude of 16,400 ft. At 25,000 ft., its power output is approximately 850 hp. It weighs 1,265 lbs, or 1.05 lb. per hp. It runs on 87-Octane gasoline and is equipped with direct fuel injection whereby its consumption at cruising speed does not exceed 0.45 lb. per hp. per hour. This model has the World's Speed Record of 468.9 mph to its credit, established in a Messerschmitt Me 109 fighter on April 26, 1939. The Mercedes-Benz DB 601 aircraft engine, built by the firm of Daimler-Benz A.G. in its huge factories at Stuttgart-Unterturkheim and elsewhere in Germany, is perhaps the best known military engine in Continental Europe. Undoubtedly, it has seen the most active service as it has been used extensively in large numbers of Heinkel He 111 bombers and Messerschmitt Me 109 fighters since the first days of the European War. It is also used extensively in Dornier Do 11 and Do 215 bombers, and in Heinkel He 112 interceptors and Messerschmitt Me 110 convoy-fighters or destroyers. When final production figures are calculated, it would not be surprising to learn that at least 100,000 of these engines were produced during the years 1939 and 1940. The DB 601 was developed from the DB 600 engine of similar design which was introduced in 1937 to meet the demand for a high-performance military engine. Low weight and economical fuel consumption, together with maximum reliability, were stressed as essential requirements. The over-all dimensions of the engine have been kept as small as possible to reduce head resistance and its exterior cleanness simplifies the cowling problem to a great extent. The inverted cylinder construction and cantilever method of suspension in the airframe permit interchangeability between both models of the Mercedes-Benz engine and the Junkers Jumo 211 engine which is of almost identical size and power output. The earlier Mercedes-Benz DB 600 was rated at 1,050 hp. at 2,400 rpm for take-off and also developed this power at an altitude of 13,100 ft. It was equipped with a pressure carburetor between the supercharger and the intake manifolds and an automatic timing device which permitted a 10 percent overlaod for a period of one minute. Using 87-Octane gasoline, four of these engines installed in a Junkers Ju 90 airliner established a World's Record by carrying a payload of 10,000 kg. (22,050 lb.) to an altitude of 7,242 m. (23,750 ft.) on June 8, 1938 in Germany. 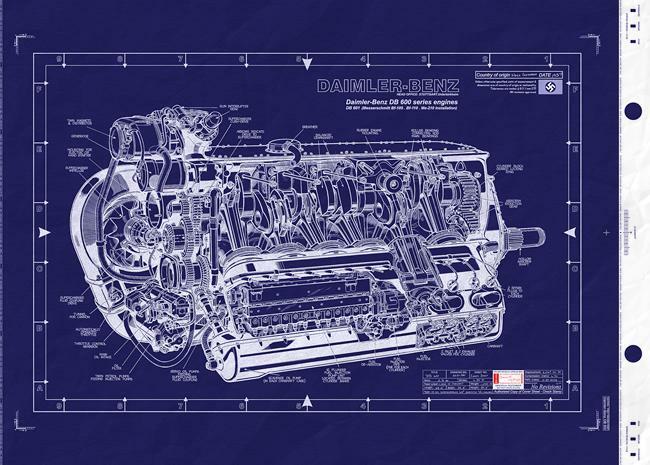 Daimler-Benz DB 600 series engines - one of those designs that turned out to be right from the very start... Inverted mounting provided better visibility, lower center of gravity, and improved maintenance access. In the Bf 109, a cannon was mounted between the engine banks and fired through a propeller hub. The DB-601A in the Bf 109E, used fuel injection instead of a carburetor, a great asset in combat since the engine did not cut out under negative g' forces. This engine was also used in some Heinkel 111s and license-built versions in the Macchi MC.202 Folgore and several Japanese aircraft. This concern, which was the descendant of the oldest auto mobile factory in the World, took its present form in 1926 by the amalgamation of the former firms Benz & Cie., Mannheim and Daimler Motoren Gesellschaft, Stuttgart-Berlin, originally founded by the inventors Carl Benz and Gottlieb Daimler respectively. The Daimler firm supplied, up to 1911, all the petrol engines required by Count Zeppelin for his dirigibles. Up to 1911, the factories of Daimler and Benz developed petrol aero-engines, and were most successful in very many air displays and aero records. In 1913, both firms took part most successfully in the German Kaiserpreis-Wettbewerb for aero-engines. During the War 1914-18, both firms were the main suppliers of all the more powerful aviation engines, with which German aircraft were fitted. By the Treaty of Versailles, both firms were forced to stop the construction and building of aero-engines of any kind. In 1926, the former type of 120 h.p. Mercedes D IIa six-cylinder engine was rebuilt and a small 20 h.p. 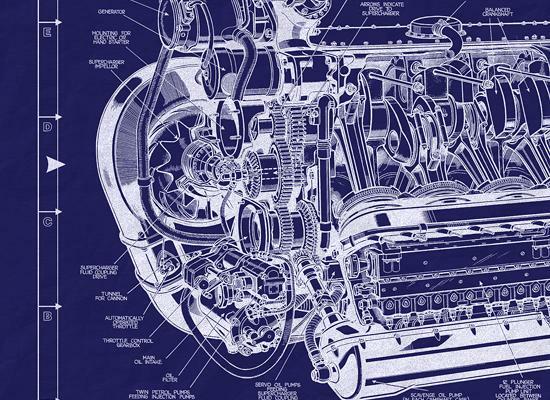 air-cooled twin-cylinder aero-engine developed. In 1928, the 800/1,000 h.p. F.2 twelve-cylinder water-cooled petrol aero-engine appeared. From this, in 1930, a similar 750 h.p. Diesel aero-engine was developed for long-distance air traffic. From these successful experiences Daimler-Benz produced, in 1933-34, a new 900/1,200 h.p. water-cooled sixteen-cylinder airship Diesel engine for the Zeppelin L.Z.I29 Hindenburg. In November, 1937, the new Daimler-Benz DB 600 appeared. 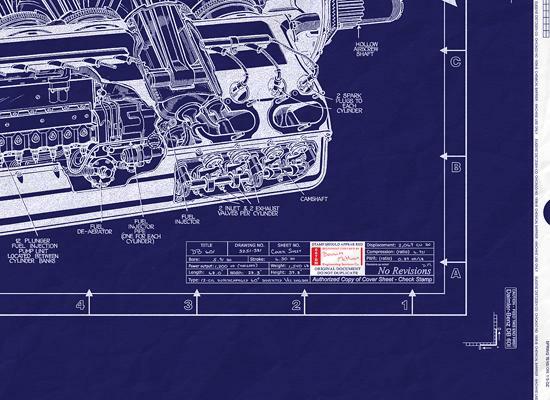 This was a particularly interesting technical development as the twelve cylinders were arranged in inverted Vee formation thus, with the crankcase, forming an inverted Y. The new engine established a number of important records for Germany. A re-design of the DB 600 to incorporate direct fuel injection and improved supercharging capacity resulted in the DB 601, which established further records. The racing version of the DB 601, which set up a World's Speed Record of 469.2 m.p.h. (750.7 km.h.) in a special Messerschmitt Bf 109 R monoplane in 1939, was specially boosted to develop a maximum of 1,800 h.p. at 3,500 r.p.m., in contrast to the normal maximum output of 1,050 h.p. at 2,400 r.p.m. for the then standard engine. The DB 605 was a development of the DB 601 and was very similar in basic construction to that power unit. The main improvements increased the maximum permissible r.p.m.. Altered valve timing increased the inlet period and improved the scavenging to give greater volumetric efficiency at higher r.p.m. The Daimler-Benz engines most widely used during the war were the DB 601, DB 603 and DB 605. The DB 606 and 610 coupled engines were installed in the Heinkel He 177. The Daimler Benz company also undertook development of the turbo-jet and one unit was built and run in the Autumn of 1943. Work on the project was then stopped by the German Air Ministry because the design was more complex than those of other firms.